The Pony and Trap Drive was an enormous success. 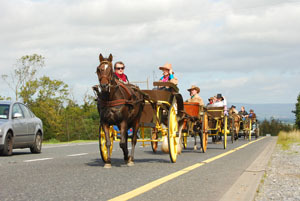 The drivers and their passengers were dressed in American Western style (based on the musical Calamity Jane). It was a glorious sunny day and the event raised a total of €6,500 for marfan research. A big thanks to all participants.